In 2002, when David signed up to become a Big Brother through Big Brothers Big Sisters of Metro Atlanta, there was a lot on his mind. Did he have the time? Would he be a good Big Brother? Could an out gay man be accepted as a mentor? Would his Little Brother or the child’s family be uncomfortable with having a mentor who was gay? All these questions swirled in his head. What was not on his mind then was attending the Super Bowl. 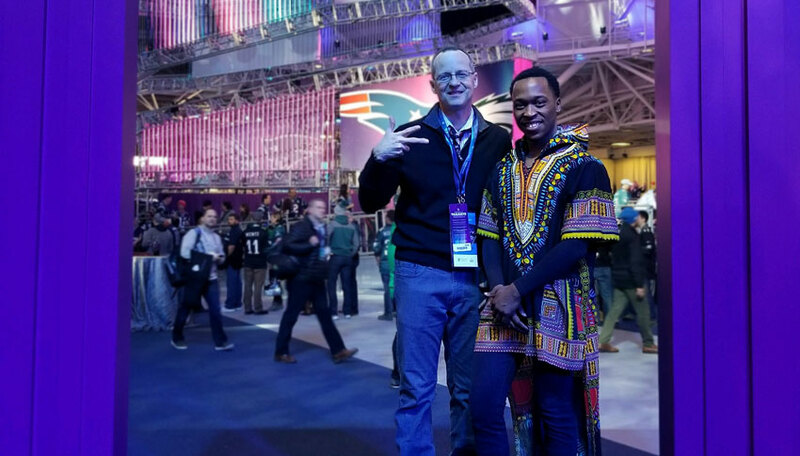 In Minnesota, Big Brother David and Little Brother Wesley, who is now 25, were in the stands to watch Nick Foles and the Eagles take on Tom Brady and the Patriots in Super Bowl LII. They won tickets because David submitted an essay to the #CreateChangeContest, and Russell Wilson, the quarterback for the Seattle Seahawks, chose David and Wesley’s story as one of the winners. So, they headed to Minnesota together to celebrate their match and take in the Super Bowl. “I just, Wesley and I both, we hear about how many children are waiting for Bigs, and we wanted to tell our story to maybe inspire someone to decide to become a Big and give back,” David says. Sixteen years ago, David and Wesley met for the first time. Little Brother Wesley was 9. They carved a pumpkin together – it was Wesley’s first time making a jack-o-lantern. Starting then, they met up to do projects and homework all through Wesley’s middle and high school years. Wesley confided in David when other kids at school bullied him. David was always there for him to talk about what had happened or to advocate for him at school. “I think he was sort of recognizing that he was different. He threw himself into his grades, his studies,” David says. At one point when Wesley was in high school, he asked David to drop him off at a friend’s house. David could tell something was up. “Don’t you have something to tell me?” he asked. Wesley looked down. At that moment, Wesley felt like it was the appropriate time for him to come out to his Big, so told him that the boy was his boyfriend. “I just figured you already knew and I didn’t have to say anything,” Wesley said. Working so hard through high school paid off. Wesley got scholarships and headed to Piedmont College in Georgia to study mass communications. He graduated and hopes to become a television reporter. For the last year, Big Brother David has been helping his Little Brother Wesley with an even bigger project. Wesley’s sister was struggling, so Wesley took custody of his sister’s infant son, D.K. “So he’s sort of an uncle-dad and I’m sort of a grandfather,” David says. David often babysits, and his extended circle of friends have supported Wesley and D.K. as they adjust to being a little family. The questions that David had all those years ago about whether he would be a good mentor and whether he would be accepted as a Big Brother have long disappeared, and his relationship with Wesley is simple. They are just brothers, sitting in the stands, watching a football game.